A range of large refractory based ovens. Both residential and commercial solutions. 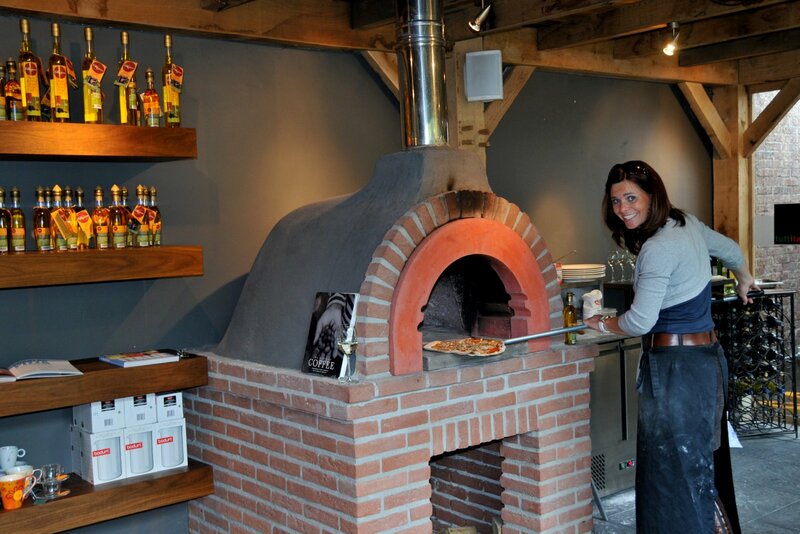 Pizza Forno are delighted to present the range of Zio Ciro wood fired ovens. We have formed a partnership with Tek Ref the manufacturer of Zio Ciro ovens to distribute what are some of the finest high capacity ovens in the world manufactured from the finest refractory castable materials. If you are looking for a ready to use or build in oven to become a centre piece for your outdoor kitchen we have a Zio Ciro solution to suit. The Zio Ciro range comprises both fully assembled and kit form ovens. The Subbito Cotto is a fully assembled oven, insulated, weatherproof and including stand. A gas version is also available including a Mini oven where space is a premium. The kit ovens such as the Ischia are designed to be the heart of an oven installation and can be finished to your taste to blend in with an existing buildings to make a real statement in your outdoor kitchen! There is a Zio Ciro oven to meet all customers’ requirements and sizes. The Subito Cotto series 80 and 95 which is our largest pre-assmbled oven. Fully insulated and weather resistant. The 80 offers almost 80cm of internal cooking space and the 95 a huge 95cm internal diameter, for those really serious gatherings! Ideal for large parties and commercial use where high volume is anticipated. The 80 is capable of cooking 3 medium pizzas and the 95 is capable of cooking up to 5 medium pizzas at once, up to 7 with the optional gas burner kit. Fantastic cooking performance and high thermal mass gives amazing heat retention, you will be able to bake breads, focaccia and many more dishes long after the fire goes out! The Subito Cotto MINI is a real refractory gas oven, fully portable and weighing less than 45 kg. It has an internal diameter of 40 cm and can reach a temperature of 450 °C (852 °F) in just 30 min. The MINI is ideal for baking pizza with a diameter of 33 or 34 cm and can be placed both indoors or outdoors, in a garden, or on a balcony or terrace. Thanks to the refractory dome, the oven traps the heat inside for a long time even when the flame is off and can cook many other types of food such as meat, bread, vegetables or desserts. The oven is equipped with a gas burner compatible with butane and optionally propane gas. Eg Calor, GAZ etc. Delivered in an easy-to-assemble kit containing all the necessary components. The ovens are sectional so comfortably handled during assembly .The clear installation manual makes assembly straightforward. The kit can be easily assembled in your garden, patio, indoor or outdoor kitchens. All Zio Ciro ovens are made from high quality refractory castable that ensures durability reduced wood consumption and heat retention. As standard we supply two sizes of kit oven the Ischia110 and the Capri 140. These are both a large hearth size oven. We can supply any oven in the range including the Commercial ovens which are made from much denser material to stand up to constant use. One of our large round oven kits, the Ischia Pizza Oven Kit offers 110cm of cooking surface, enough for larger gatherings and great parties! Your imagination will be the only limit for this oven! This oven can easily handles multiple trays, meats, pasta dishes, breads or focaccias! Other round ovens include the Napoli the smallest, though to the Positano the largest road oven with an internal hearth of 120cm. The Capri, Procida and Sorrento series of oval shaped oven kits were born out of the need to accomodate larger pizza ovens while maintaining a relatively small frontal footprint. To achive that the central part of the oven has had a additional element added to it to increase the available internal surface. With a massive internal surface measuring 100×1400 mm, the Capri Pizza Oven Kit offers and abundance of space for all of your cooking needs, offering enough space for several pizzas, roasts, breads, pasta dishes and more. Zio Ciro has been producing Pizza ovens in Italy since 1997, and in the 20 years they have been in business they have produced some 30000 ovens, sold in over 17 Countries. Today their ovens are recognized as some of the finest pizza ovens available on the market, bringing professional quality to pizza enthusiasts everywhere. Each oven is handmade in Italy, by a small group of modern artisans who pride themselfes in combining the best materials and a long tradition of excellence. Whether you are looking for a fully assembled oven, or kit to finish to your liking, we are sure we can help you find the perfect oven for you! A wonderful compliment to any summer kitchen or patio, Zio Ciro pizza ovens will help you create memories you will cherish forever!